Redesigning The Box: A toolbox for educating the cocreators. As regular facilitators of collaborative design processes, we are always excited to work with creative young minds, especially those from Johannes Highschool in Frederiksberg, Copenhagen. 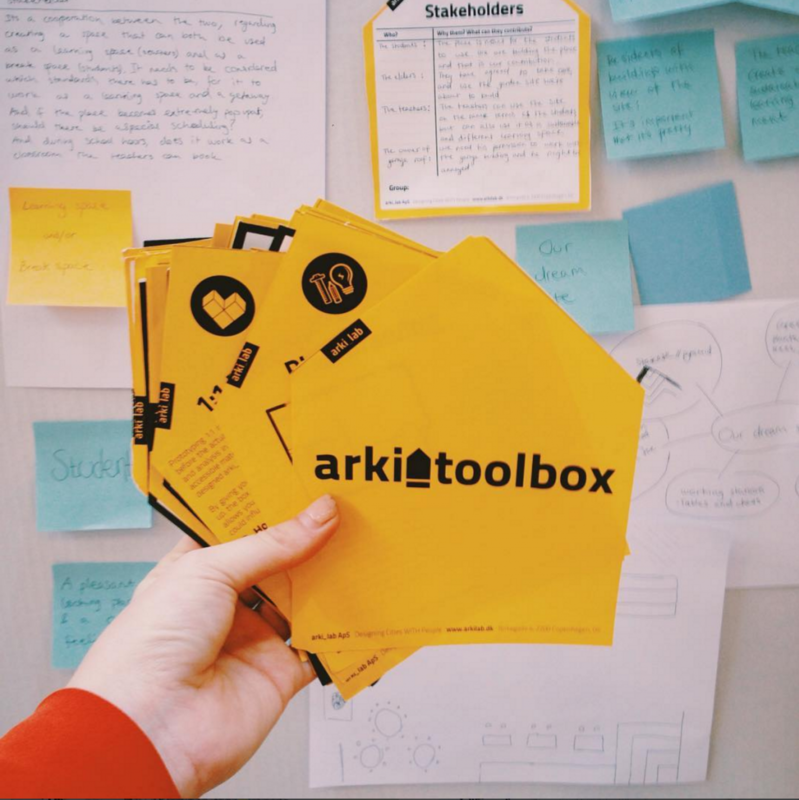 With the extensive experience we have with user-involvement, arki_lab has developed a set of tools to activate and engage all possible stakeholders. These tools are multidisciplinary, informative and interactive which makes them a key in unlocking the creative and social potential of a new design project. We applied these tools to the process of place-making at the school because the students were tasked with not only the design of the new site but with building it too! With arki_lab’s focus on the translation of ideas into concrete sketches for our projects – we are always trying different techniques that ensure citizen’s voices appear in the final design. We’ve learnt this high level of involvement is pivotal in the survival of the site and the design due to notions of ownership, responsibility and functionality. When we were asked to work with a small, forgotten, dirty site on the edge of the Johannes Highschool property, and to design a place the older students could call home; we had to think outside the box… or redesign the box completely. A toolbox, noun; a box to organise, carry, and protect one’s tools, used for trade or DIY, contents vary with the craft of the owner. Our task was to engage 50 highschoolers in learning, understanding and using ‘the design process’ to produce a comprehensive plan for a 60m2 site on the outskirts of the school property. We designed a three phase engagement plan for the two day workshop that drifted from DISCOVER, as we start every project with a thorough investigation of the real world, to DREAM, after we explore various visions, ideas and realities, then to DESIGN as we experiment with different solutions. We wanted our toolbox to be a universal one, where the tools can be adapted and adjusted to be used in different contexts and different phases in the design process. Each tool card describes the design tool in an informative and educational way while also explaining why this tool is used and instructing readers with concrete steps on how to use the tool. Simplifying the techniques and intentions for each tool allowed us to refine the process to allow for the best learning experience for our students as well as synthesising the most wholesome design process for the two day workshop. This is a true design-build project and it was so important that the students collected as much of the right information as possible (discovered), explored all their needs, hopes and desires (dreamed), and spent time crafting the reality that they will build in May (designed). In our planning of the workshop, we quickly discovered that time was our most valuable tool to work with and that to use it most wisely, the process would have to be closely guided. So we selected nine of the most relevant tools from across the design process to schedule for the day. Each tool was placed in the schedule in a way that made sense for the site and aligned with our expertise. Our first finding was that this sequencing effects the design ideas and outcomes more than expected. Students that began with the Stakeholder Analysis card in the DISCOVER phase, were more constrained by external interests in the DREAM phase which resulted in more moderate designs in the DESIGN phase. In this regard, the sequencing and distinction of the phases felt somewhat superficial. Facilitating creativity is a difficult task, one that needs to be organic and patient. Translating how this process can work in a classroom environment is a constant consideration of ours and will implicate the development of our toolbox. The students learnt a great deal about each tool, were able to complete the instructive tasks independently as well as produce high level data from the site and for the site. The two day workshop resulted in new flock of educated young place-makers and inspiring visions for a new shared space at Johannes Highschool. It was inspiring to see how engaged the students were throughout the process because they understood the reality that this would be a “real” project; one they have a crucial role in designing and building. It again tell us how important it is to involve students in the shaping of their surroundings because it brings a fresh learning perspective and a new level of engagement to the room. Back in our room, our quaint office in Nørrebro, we’ll continue to develop the arki_toolbox with the aim of open-sourcing and sharing our methods to a wider audience. Outside of that, we’ll continue working with the students to collect recycled materials from our collaborator “Guldminen” for the building the space in May! Follow the process on our instagram.